Pretty soon I'm going to do a post about my grandmother's jewelry box, which came to me after she passed and is filled with treasures I can't wait to share with you. But it's going to take a bit of photography work to put that together. So until I can find time to take pictures of all I pretty baubles I want to show, I thought I'd post this, as it also relates to my grandma. As I've mentioned in this space before, I don't have a lot of things from Gran, except for the twinkle in Precocious Daughter's eye, which comes straight from her. I cherish everything I do have, but there are so many little items that I wish I had been able to keep and that will always remind me of my grandparents' house. 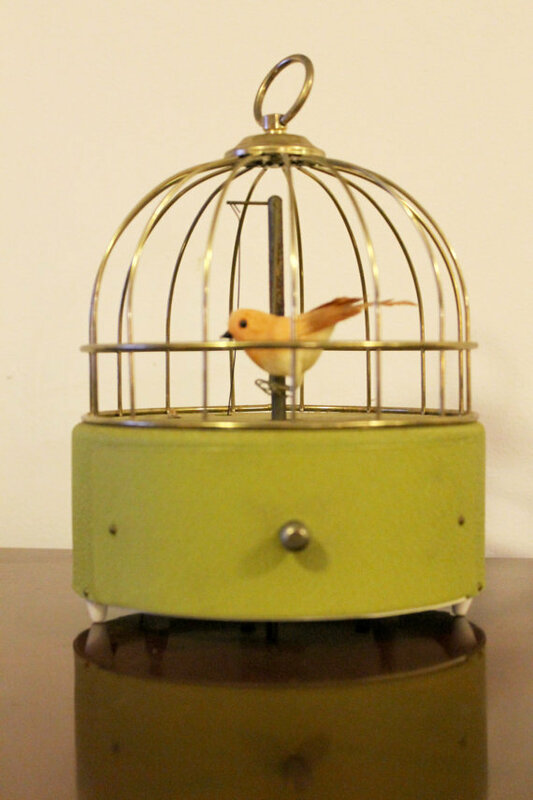 One of them is this birdcage music box. This isn't actually it, because I don't have it. I found this picture on the Internet, which has everything. But an exact twin of this music box hung in my grandma's kitchen window every day of my life until she moved out of the house. 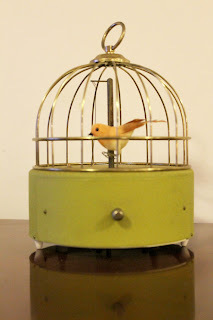 The wind-up key is underneath, and if you wound it up and then slid out the little drawer under the cage, the birdie would swing back and forth, and the music would play. To this day I have no idea what the tune was, although I could hum it for you, and even tell you the parts where the mechanism would squeak and add an odd extra note or two to the melody. I'm sure millions of these things were produced in the 50s or 60s - my grandparents were working-class people, and their possessions were not fine. But this cheap little bird jerking to and fro on its spring-driven perch simply enchanted me as a child. I can't imagine what I would actually be willing to pay for it if one ever crossed my path again. I would hang it in my bedroom window and wind it up just about every damn day. And it would make me happy every time. So I'm on the lookout for one. If you spy one, with its shiny gold cage and its fugly-green felt(?) body and little yellow bird, do let me know. And if you wind it up and recognize the tune, tell me. I'm dying to know what it is. I had one similar to this when I was a kid. A gift from my grandparents. Looked a little different. Played the Theme From Love Story. Being a kid, I kind of played a little too rough with it.